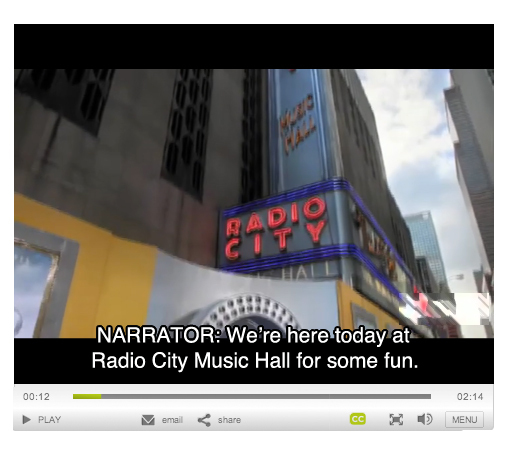 Brightcove technology partner 3Play Media provides premium captioning, transcription and translation solutions to higher ed, enterprise and government organizations. 76 percent of B2B marketers are using video for content marketing according to a recent study by Marketing Profs, the Content Marketing Institute (CMI) and Brightcove, but chances are you know this, because you are one of these savvy marketers (and you read Bright Ideas every day). This means we don't need to enlighten you to the benefits of video, but we do know you're here to understand how you can take enhance your video marketing efforts. So let us introduce you to the marketing powerhouse that is online video publishing with transcription. Video transcripts and captions improve upon key SEO metrics while making media consumption flexible and safe guarding the user experience. Interested? We knew you couldn't resist, let's dive in. Simply put, video is an amazingly engaging medium. Video alone increases engagement because of the way in which the message is delivered. The Psychology of Web Video teaches us that a simple message conveyed to a well understood audience is key. Both of these factors assist in retention. But more so, video is the vehicle for supreme message delivery. Video's combination of the senses delivers something special. After three days, humans will retain 68 percent of information both heard and seen versus only 10 percent of information read. It should come as no surprise, then, that transcribed video improves the online learning experience, increasing comprehension and retention. We truly can't help but be pulled in, bewitched and engaged. For instance, Zappos implemented product videos which converted 35 percent more over plain text product pages. The information was simple, they knew what their audience wanted, and instead of producing a massively long product description, they made a video. Fantastic. Why can’t we all be Zappos? Let's tap into this special magic. Engagement is a burgeoning buzz word in the marketing community, but not without warrant. In many ways, strategies for higher engagement are meant to combat two SEO hardships: time spent on site or bounce rate. A short visit or a high number of exits call into question the trustworthiness of a website and quality of the user experience. It's a ripple effect. Site visits and unique visitors won't grow if Google questions the credibility or usefulness of a site, in turn leaving site monetization and sales stunted. Video is part of the answer, increasing site visits from 42 seconds to 350 seconds. But your video marketing goal should not just be more watching but more exploration of your site. Transcripts and captions can help. Studies show that transcripts increase engagement, while captions increase the completion rate of video from 40 percent to 80 percent. Still, no one wants a visitor to simply watch a video and then close the window, this is still regarded as a bounce and could negatively affect the quality score of your website. Navigation and cross-linking can assist this. To keep engagement going, utilize the linking opportunities transcripts provide. By linking each video to a plain text transcript, you can add to site size, create more internal links, and present Google an additional opportunities for indexing. Paginating long transcripts and grouping the text thematically takes this concept further. But don't forget video; on each page find space to curate additional video content for consumption. Building an experience is important. Enhance all media pages and deliver highly relevant content. This will increase the time spent on site and strengthen the positive association with your brand. Transcripts go beyond mere text links, media options provide value to visitors. Pages utilizing video, text, and images are more likely to receive inbound links! In an article by MOZ examining what makes a link-worthy blog post, it was shown that a text-based post will only receive, on average, three inbound linking domains whereas a video alone receives eight. When we combine all three media types, blog posts receive inbound links from seventeen domains, on average. We can only infer that all of these elements together, heighten the perceived value of the piece, making them worthy of links. Video transcripts allow your audience to choose their site experience. As we discussed in Reaching a Wider Audience through Accessible Video, SEO and an Enhanced User Experience, accessible options and control of the user experience is more important than ever to SEO. After all, today's sophisticated Web user doesn't have time to scour your site for the information they want. If a searcher desires text content, for example, those "copy and paste" addicts we all know, they'll bounce back from video content and simply re-execute the search. Google favors options and universal design for this reason. And while it might seem a bit blasphemous to say this on the Brightcove blog, sometimes audiences have just had enough video. Wait, put away the pitchforks! We've all heard at some time or another that people are either visual or auditory learners. In actuality, humans are a bit of both. The "dual coding theory" asserts multi-sensory learning styles are more effective because we can only absorb so much through one medium. A "channel" can become "overloaded" and to compensate, our brains will switch to another mode of comprehension. This is why the Web is becoming increasingly diversified in terms of media options and why transcripts and captions can are vital to the absorption of long-form content. Whew! That was a lot. Let's recap. Shannon K. Murphy is the content marketing manager for 3Play Media, an online video captioning and transcription service located in Cambridge, Mass. Prior to 3Play Media, Shannon worked as a marketing consultant at HubSpot and Dow Jones Local Media. Shannon has been passionate about SEO, inbound marketing and content creation since 2008.